Name one thing better than mac and cheese. Do you know the answer? HEALTHY vegan mac and cheese. I knew you were a smart cookie. Comfort food without the comfort belly. Just what the doctor ordered… Not that I know what the doctor ordered, but I am sure the doctor wouldn’t hesitate to order this dish. 286% of your daily vitamin C, 43% of your daily fiber, and 43% of your protein requirements for the day, all in one giant bowl of comfort food heaven. Yes please, thank you very much, I will eat you ALL. This is the perfect dish for when you just want to cook up something easy, creamy, satisfying and guilt free. Your skinny jeans will thank you! I just want to take a moment and thank everyone who filled out the Reader Survey. You guys are seriously the best ever! I learned so much about what you love and don’t love so much about It Doesn’t Taste Like Chicken, and it just means we are gonna have even more fun here. Lots of exciting new ideas to come! So thanks again for taking a minute to fill it out. Now on to comfort food! The first thing you want to do is make the Quick & Easy Cauliflower Cream Sauce. You can make this ahead of time if you want to, so it is good to go. Just make sure to heat it up before you use it in this recipe. 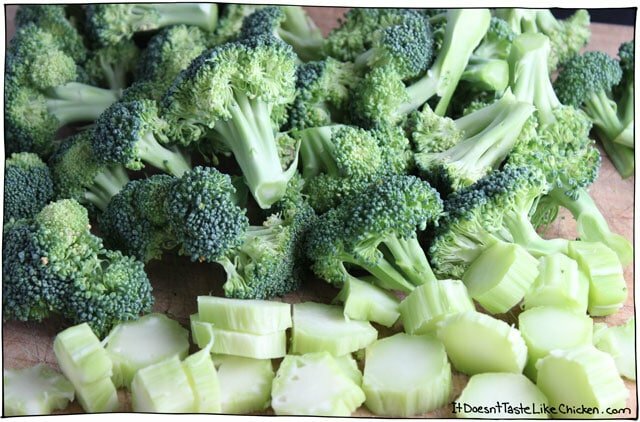 Then chop up the broccoli into florets, and peel and chop the broccoli stems. Now I know some of you are broccoli stem haters (I will never understand you! ), so if you don’t want to use the stems, you don’t have to, but personally they are my favourite part. Bring a large pot of water to a boil and cook your pasta. 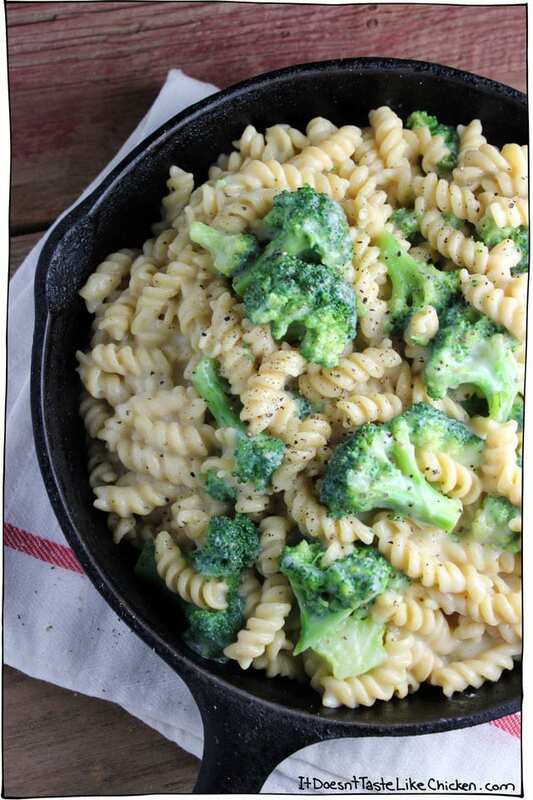 At the last two minutes of cooking, add in the broccoli to cook along with the pasta. Then drain. 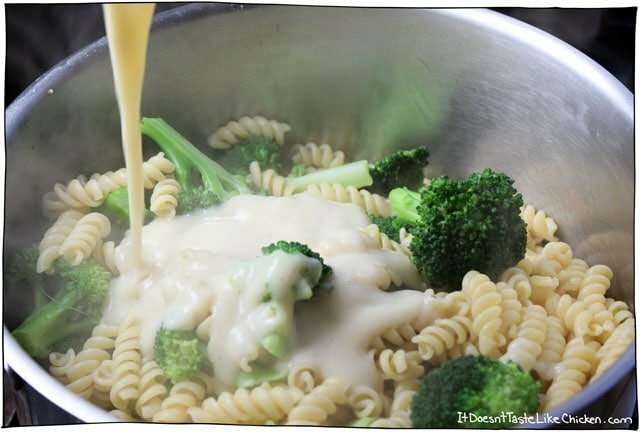 Return the pasta and broccoli to the pot and mix with the hot cauliflower cream sauce. Season with salt and pepper as desired, and then dig in! This recipe uses a cauliflower cream sauce, making the recipe super healthy and vegan! Your skinny jeans will thank you! 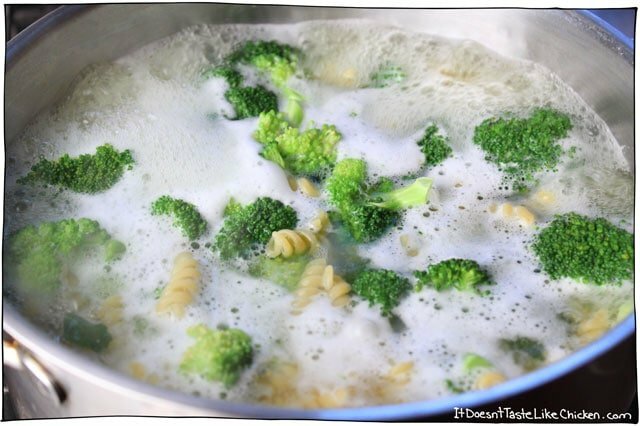 Boil pasta according to instructions, and when two minutes of boiling time remain, add in the broccoli along with the pasta to cook. Drain the pasta and broccoli and return to the pot. Stir in cauliflower cream sauce and season with salt and pepper to taste. 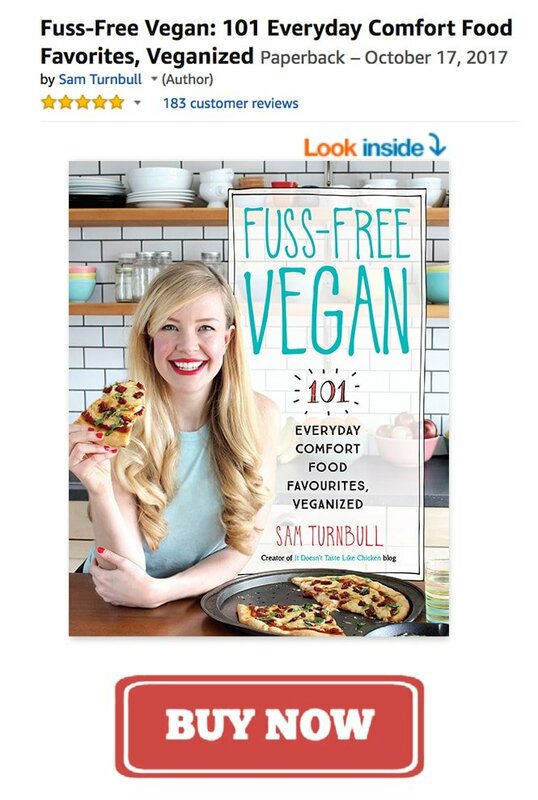 *For a gluten free dish, just use a gluten free pasta. My favourite is brown rice pasta. Featured Ingredient: Broccoli. 21 Ingredients, 17 Days to go! So good and kid approved! And easy! Thank you! I’m in shock. This recipe, was incredible! My ridiculously picky toddlers had five or size servings of this stuff!!! Sure, they picky out the broccoli but they do that for everything. My hubby hates cauliflower and really enjoyed this! Thank you thank you thank you! 4 out of 4 of your recipes have been a success! I can’t wait to get try the rest! Oh, and it made soooo much pasta!!! Which works perfectly for us, since we always have leftovers for lunch the next day. This recipe made a huge pot of food! So much, I had to use a dutch oven to make it and it took two casserole dishes just to hold the leftovers. Six cups of dry pasta seems like a lot. Did I do something wrong? However, there was the right ratio between the sauce and the pasta, so maybe that is right. Just what I was craving! The other day I tried one of the Amy’s frozen entrees that’s basically this dish, except it has panko (or some similar topping). Those are pretty spendy, so I’m looking forward to being able to make this myself — many thanks! I’ll post back when I try the recipe. That might be a while though; starting this week, I get CSA boxes until mid-October so I’m really reluctant to buy additional veggies since it’s already a challenge eating the contents of each box before the next one arrives! It’s my first year doing this, so this will be fun. 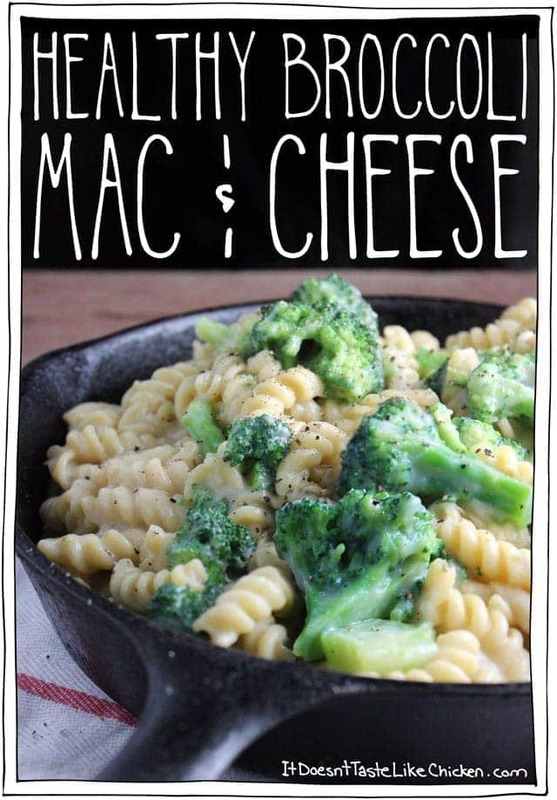 Sam… Thank you for posting a recipe that uses the Cauliflower Sauce. I’m so incredibly unimaginative in the kitchen, which is why I LOVE recipe books and blogs like yours… they give me clear instructions on what and how to cook! Then I can get inspiration to push my tiny little cooking envelope! 🙂 Anyway, made this last night and it is awesome. The Cauliflower Sauce is just ridiculously simple… I used a hand-blender. 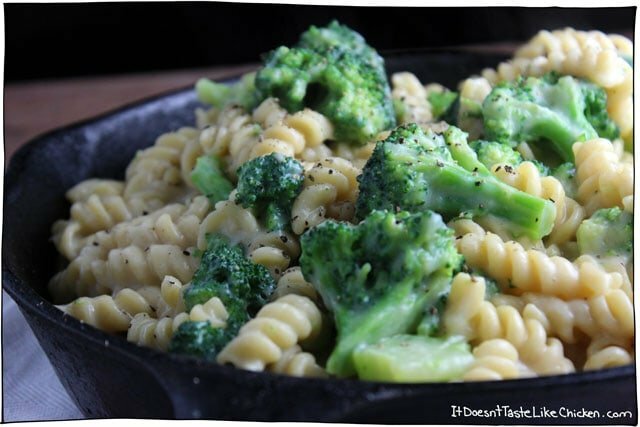 And this Broccoli Mac & “Cheese” was just as simple… do dinner was simple… simple as that!! 🙂 Thanks again. You are so super welcome! So happy you continue to love my recipes, it totally makes my day. Allô, I read all your recepes and I love to cook them. There all delicious! I just have to read It and I know that it’s gone a be a “succès “. Tanks to you Sam and continue the good job! Aww thank you so much! I wish you left your name so I could thank you properly.